To avoid damage to the Raspberry Pi that might otherwise be caused by the greenhouse environment, I packed the computer and the electronic charging system into a waterproof housing. The handful of electronic components can be soldered onto an off-the-shelf circuit board. The circuit layout, which you can download from the Raspberry Pi Geek FTP site , provides an overview of how everything fits together. Because the GPIO interface 3.3V is insufficient to start the switching action of the MOSFETS, I build a small preliminary stage via a photocoupler. This approach also saves the life of the Rasp Pi in the case of a surge in the power amplifier. The MOSFETS get mounted on cooling elements because they become very hot running in PWM mode. Running in pure switching mode would not require cooling. To make the assembly easier in the greenhouse, I placed all connections on a terminal strip. As described in the box titled "Making 5 Out of 12," a DC to DC converter assumes the role of voltage supply. Figure 2 shows how the intelligent greenhouse control looks when assembly is finished and it is mounted in a waterproof housing. To get the 5V needed by the Raspberry Pi out of the 12V from the solar energy electrical system, I use a DC to DC converter TSR 1-2450 from the Traco Power company . The converter works better than a linear voltage regulator because it has significantly less power loss. In this case, a linear regulator would convert more power into heat than the power the Rasp Pi needs to operate. The TSR 1-2450 achieves an efficiency factor of more than 90 percent in this project and produces almost no heat. With respect to voltage supply, it is possible to supply voltage to the Raspberry Pi over pin 2 (+5V) and pin 6 (0V) on the GPIO interface, so there is no need for a USB cable. Figure 2: The greenhouse control board when completely assembled. Don't place artificial limits on yourself when you implement your own system; however, you should remember the mundane and yet very necessary items like an on-off switch. The Raspberry Pi itself doesn't have one, and it's connected directly to the power supply. Figure 3 shows the pinouts of all the semiconductors that were used. Figure 3: Knowledge of the pinouts is helpful when populating the circuit board. The circuit layout in greenhouse_2.sch shows the disposition of the DHT22  humidity and temperature probes, the ordinary PC fans used for ventilation, and a 12V submerged pump (available in home building supply stores) for watering the plants. A laboratory power supply replaces the battery and the solar panel during test mode. An updated version of Raspbian on an SD memory card serves as the basis for the software. The card should have a minimum 8GB capacity for applications and data to plan for the long term. After installing the system, you should download several updates and install an Apache web server, a MySQL database, and the tools needed to compile the programs (Listing 1). When installing the database server, you will be asked to set a MySQL root password; remember it, because you need this password later. Compiling the program takes a while because the Rasp Pi does not exactly run like lightning. 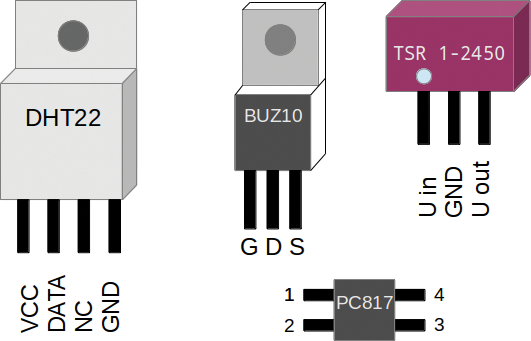 Once the build is finished, you should perform the first test and read the data from the GPIO ports with gpio readall (Listing 2). For the fans used in this project, the values range between 14,000 and 17,000. The values vary from fan to fan; therefore, it is best to determine the upper and lower limits for each of the fans in use. You will need to enter these values in later scripts. Keeping up with a garden is a lot of work. 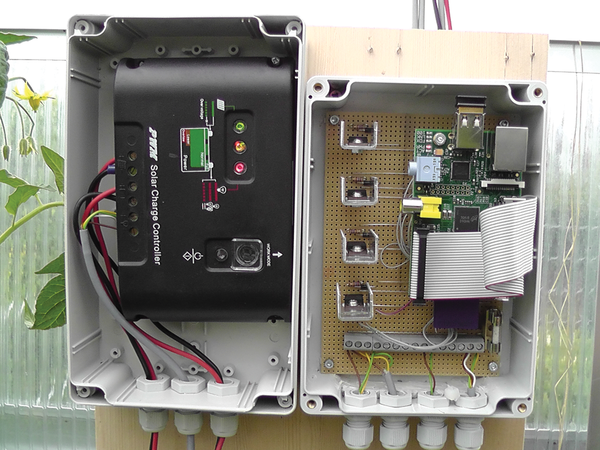 Luckily, with a Raspberry Pi, you can automate your greenhouse.